When assessing the green credentials of your house, or investigating where green improvements could be introduced, there are a number of areas to explore. Many green solutions are relatively straightforward, while some will involve major upheaval and may be more suited to a new-build project than a retrospective fit. Use the information given here as a link to more detailed analysis later in the book. You will see that there are greener options for nearly all aspects of DIY. There are advantages and disadvantages with any building technique or material, and eco-friendly options are no different. If possible, it is always important to substantiate a manufacturer’s claims with hard evidence. As in any aspect of life, manufacturers are concerned primarily with selling goods, so it is necessary to compare products, research different ideas, and make sure they meet your own needs. The areas covered here deal with most aspects of what is currently available in terms of making your home a greener place to live. Using the relevant page references, you can refer to various parts of the book for more in-depth information — and to learn how to carry out green projects yourself. If all houses featured many of these ideas, the energy usage of the population as a whole would be significantly reduced. However, the initial financial outlay must always be considered. With low-energy lightbulbs, for example, the initial cost is low, so the pay-off is fast—in terms of saving both energy and money. But with larger, more expensive projects, such as installing solar panels, the energy-saving pay-off may be quick, but it will take far longer to recoup the initial costs. 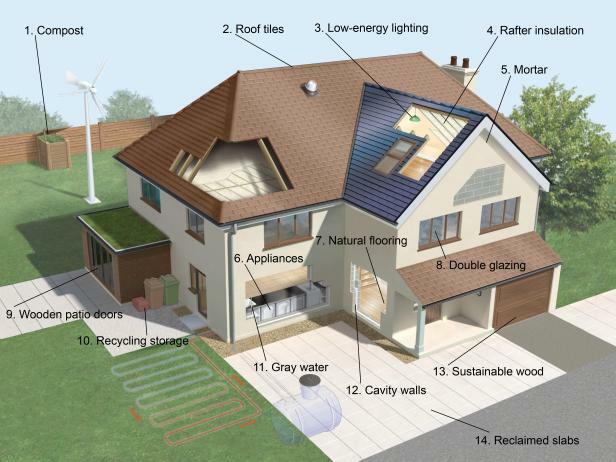 The best advice is to address the key options first (insulate well, use low-energy electrical goods, and recycle), leaving the more complex projects to form part of the decision-making process of any future home improvements. Making compost is the ultimate expression of green living — turn your food scraps and yard debris into fertilzer. Consider using reclaimed clay or stone tiles, or slates. A small investment can have a large impact on saving electricity. In a lived-in roof space, ensure the ceiling is insulated sufficiently. For brick or stone homes, lime mortars are far greener than those that are cement-based. Be sure to choose energy-efficient models. Choose flooring from sustainable sources or materials such as bamboo and cork. Double or even triple glazed windows will always make your home more energy efficien. Double-glazed windows need not be UPVC or aluminum. Wood is a greener option and will last just as long if well it is well-maintained. A good system of sorting materials for recycling is essential for every home. As well as using collected rainwater in the home, you can also recycle water from sinks, baths, and showers. Well-insulated exterior walls can help to further reduce your energy requirements. Make sure that any wood you use in your home comes from a sustainable source. It is not always necessary to buy new — consider using reclaimed bricks and patio pavers. This entry was posted in Green Tips and tagged Green Tips.